KoopaTV: Play SOVIET MISSILE RUN Right Here! If you would like to play full-screen, click here. ...Don't right-click the embed or you'll lose control. Soviet Missile Run features several platforming stages, a minigame, a multi-phased boss fight with creative missile usage, and for the first time in KoopaTV history, an interactive credits level! Soviet Missile Run has full voice-acting, and since it takes place in the Soviet Union, many of the characters are speaking in RUSSIAN! You can choose whether or not you want English sub-titles. 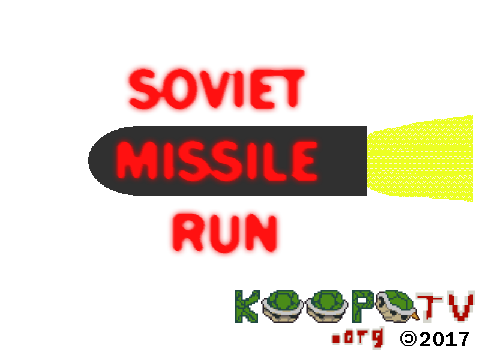 Soviet Missile Run also returns the tradition of KoopaTV's games featuring an original full-length song, also named “Soviet Missile Run”. Get this: It is in multiple renditions in the game. Not just one, but MULTIPLE. The game is packed with detail and production values. It's shorter than KoopaTV's previous games, which allowed us to spend more time on those finer details. The game feels great to control and play, which is how a platformer should feel like. 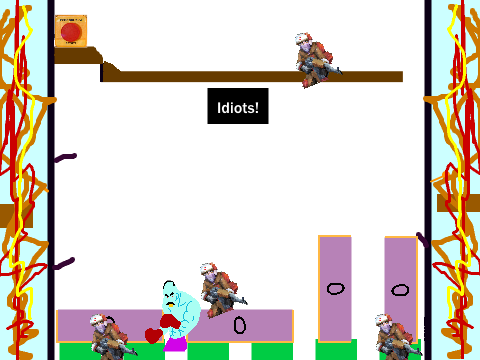 Soviet Missile Run is also KoopaTV's first videogame where we started off with a gameplay concept (a platformer utilising the Donut Lift platforms from Super Mario World — platforms that would fall after you've stepped on it), and then the game was made around it. This is opposed to KoopaTV's other games, where they started from a political philosophy we wanted to express with a game, and then we came up with gameplay. 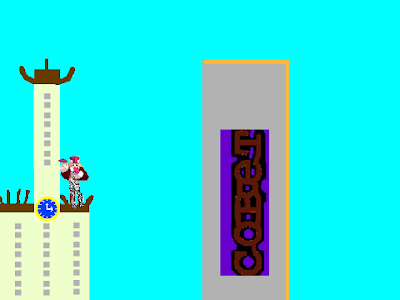 Screenshot from the start of level 1, Ascent. 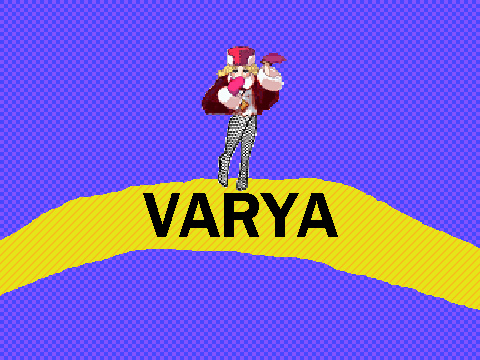 Varya needs to ride on the missile. 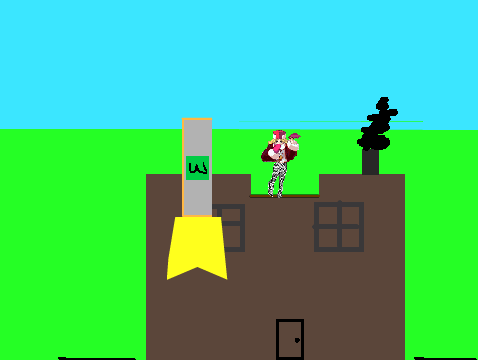 Later in the game, you'll need to defuse a big missile by playing a minigame! Varya in a cutscene, re-encountering the big missile that caused her to faint early on. How will she handle it this time? with your choice of whether or not to have sub-titles! If you have any technical trouble playing the game, stop playing it on a piece of garbage, because it has the second-lowest file size of any of KoopaTV's games, only more than Defend Anita Sarkeesian. If you have any difficulty-related trouble playing the game, pay attention to the many contextual clues in the game, and be observant of what's going on around you. Varya has no one to depend on but herself, so be alert! Look forward to Soviet Missile Run winning Best PC Game of 2017 in KoopaTV's Game of THAT Year 2017, coming up after 2017 ends. In the meantime, please enjoy the game, and you can bet that it will get special provisions in such KoopaTV initiatives like the KoopaTV Loyalty Rewards Program, and KoopaTV's Feedback Forms and Quizzes, starting in January 2018. For the dedicated page listing all of KoopaTV's games, click here. Click here for the slick 30-second advertisement video for Soviet Missile Run! Soviet Missile Run won the Best PC Game of 2017 award! Since missiles appear to be a real-life issue, Soviet Missile Run can help you deal with them. Soviets then, Russians now... and missiles everywhere. Yeah, or I wouldn't be able to make it. Still does not hold a candle to the other Soviet themed game, Soviet Rocket Giraffe Go Go Go. That game, you get to play as a giraffe. After playing wot you linked, I'll say that Soviet Missile Run not only holds a candle, but it holds a whole Menorah. This might be your best game yet, and I am not just saying that because I beat Soviet Missile Run all the way through unlike some of your older games. I actually think that this game had just the right amount of length. 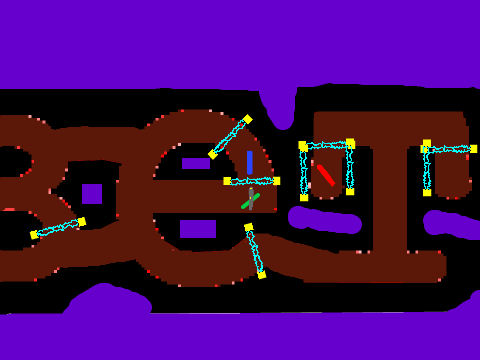 For instance, the first time I reached the boss, I hit the right arrow by mistake. However, it did not take too long to catch back up to where I was. Through playing the first few levels again, I also noticed that the scenery changed to night this time. That is some replayability that I would have easily missed out on if I had not restarted again. The mini-game was also implemented very well, and I did not have any problems completing it unlike some others in The Wonderful 1237. Plus, the 3-stage boss fight was intense and quite enjoyable. The music and voice acting was top-notch as well. I like that the ending verse of the main theme sounds similar to the 60's Spider-Man theme song, though I'm not sure if that was intentional or not. Overall, I'd give the game a 4.5/5. The only thing I had trouble with was that sometimes the lasers would blend in with the scenery on the night stage. Other than that, this game was what I had been looking forward to all year long. I was a little concerned that I had set higher expectations with Capture the Confederate Flag and The Wonderful 1237 in terms of game scope, and I was wondering if I would be able to dial it down successfully by having a smaller game and how that would go. But I guess if those games were too long for people to go through to begin with, then folks appreciate shorter games. Capture the confederate flag was better. it had confederate flags, which are good. 10/10, put the game on Steam. This game has Soviet flags/hammer/sickle imagery everywhere! The only national anthem better than Dixie's is the Soviet's, which is in this game instrumentally, so... there's that. ...I do enjoy the Soviet national anthem.